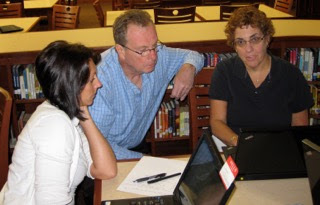 Pete Reilly is a coach and mentor to school superintendents, district administrative teams, and classroom teachers. A former high school English teacher, Mr. Reilly has served as the Director of the Lower Hudson Regional Information Center and President of the New York State Association of Computers and Technology for Education. In 1996, he visited China on behalf of the United Nations in order to help improve the use of technology in education. Mr. Reilly is the author of A Path with Heart: The Inner Journey to Teaching Mastery. The types of technology used in schools have radically changed over the course of your career. What’s your perspective on the mindful use of technology? I’m a huge advocate for the use of technology in teaching and learning, but there are a lot of caveats and disclaimers that I attach to that. I support technology that connects and empowers students and enriches their experience, but discourage technology that puts them in a passive, ‘question and response’ state. Used mindfully, technology can connect us to others in very meaningful ways. For years I participated as a client in a weekly ‘one on one’ coaching call. At first, I was skeptical. How could I have a deep, meaningful session on a phone call? But my coach helped me center myself and bring myself fully present for the call, and sure enough the technology faded into the background, his voice came into the foreground, and my heart opened as if we were in the same room. So while technology can isolate us or give us the illusion of connection, it can also bring us together in meaningful ways that were impossible in the past. In A Path with Heart, I tell the story of an art teacher named Jody who connected her middle school class by video conference to a class in Kenya and together they organized a fundraiser, “The Global Run Project,” that raised enough money to buy a water filtration tank for a Kenyan village. The last time I checked “The Global Run Project” had more than forty schools from around the world participating. The students who participated in this project learned much more than what was prescribed in the syllabus. Jody used the technology to help tap into their hearts, their idealism, and their innate desire to be part of something larger than themselves. In a previous interview, Dr. Susie Wolbe mentioned that “Children will always experience more growth if the child, parents, and school are working as a team toward the same goals.” What are some ways that teachers and administrators can include parents in decisions about their child’s education? Dr. Wolbe’s statement is totally backed up by the research I did for the book. In fact, multiple studies have shown that trusting relationships among teacher, student, administrators, and parents is one of the most powerful predictors of academic success and positive long-term emotional and social outcomes. Tony Bryk and Sara Rimm-Kaufmann have done some amazing work in this area. I generally refrain from prescribing tips and techniques for getting teachers, administrators, and parents to work together. There are so many ways to do it and what works in one situation may not work in others. However, by cultivating what I call the “personal infrastructure” of the Master Teacher, that is, a ‘self’ that is present in the moment, open to possibilities, and connected to the things one cares about, the teachers I work with find it much easier to build these trusting relationships. It’s from a foundation of ‘center’ that we find ways to create circles of trust that are just right for us. I understand the urge for simple answers to “How to do this?” or “How to do that?” but I’ve found that helping people discover the answers that lie within them has the most power. Those are the answers that are organic and stand the best chance for success in the long run. You’re a black belt in Aikido, and in chapter 17 of A Path with Heart, you suggest using Aikido techniques when coping with difficult students and colleagues. What are “getting out of the way” and “blending,” and how can they help us deal effectively with conflict? It might help to start by explaining that Aikido is a martial art that is about managing a situation, usually a physical attack, without hurting the attacker. When I talk about applying the concepts of Aikido in the classroom I’m not talking about physical attacks but rather dealing constructively with the many situations that crop up daily in the classroom. Those situations can range from a disparaging comment, to a disruptive student, to a class that’s not “getting” what we’re teaching. Whether it’s an attacker on the mat or a classroom incident, these situations can cause us to react reflexively and throw us off our center. We get flooded with stress hormones, caught up in our thoughts and emotions, and lose the ability to be fully present. In order to “blend” with a difficult student or colleague the first order of business is to bring ourselves to center. Think of this as ‘mindfulness’ in action. Getting out of the way is also about not feeding into the negative energy of a situation. That just adds fuel to the fire and escalates things. I use the analogy of dominos in the book. There’s a row of dominos as far as the eye can see. The first one is red and represents a difficult student, the next is blue representing you. The pattern keeps repeating itself. Red, blue, red, blue. Normally when an incident happens with a student the red hits the blue, the blue falls and hits the red, and the pattern is repeated until all the dominos are down. If we take ourselves out of the way, and remove the blue dominos, when the red falls, it doesn’t hit anything. The old pattern is broken. The situation doesn’t escalate. Blending is getting out of the way, centering ourselves, and finding the most effective way to manage the energy of the situation. On the mat we train ourselves to feel or blend with the energy and force of the attacker, to sense how they are moving, and in that very moment respond with an appropriate technique that brings the situation to a conclusion without hurting them. We don’t know what technique we’ll use until the moment we blend with the attacker, and we don’t use any more force than is necessary for the situation. You have to be totally present in the moment and to the energy of the attacker to do this effectively. It’s the Goldilocks effect, not too much, not too little. By the way, getting out of the way and blending doesn’t mean we give up our own center and ground, and it doesn’t mean we let our students do what they want. We simply manage the situation in a way that preserves everyone’s dignity. Aikido is about harmony, not winning. With increasing pressures on teachers, what are some ways we can balance our own needs with those of our students? You’ve hit on one of the key points of the book. I believe that by focusing on our inner lives, our emotional well-being, and classroom presence, we are also taking care of our students. It’s an inside-out approach to the classroom. When we’re stretched too thin and feeling stressed out, or we’re frustrated because we’re spending too much of our energy on what feels like pointless paperwork and non-teaching job requirements, it affects our teaching. It’s impossible to completely wall off and compartmentalize our feelings, moods, and emotions. Eventually, who we are and what we’re feeling seep into our teaching and how we show up with our students. After all, we have only one ‘self’ and as Parker Palmer says, “We teach who we are.” I like to think of us as “the living curriculum” and when we’re off-center, so is our classroom. So, how do we take care of our ‘self’? How do we deal with the stress and frustrations that are so prevalent for teachers nowadays? There are lots of ways and when I work with teachers I explore them in great depth, but mindfulness and centering practices are foundational. They don’t take away the external factors and challenges we face, but they help us respond to them differently. I’m also a firm believer in body practices. When I say body I’m talking about our entire ‘soma’, body, mind, and spirit. In addition to meditation, I think practices like yoga, tai chi, qi gong, acupuncture, bodywork, aikido, other martial arts, and other physical activities can help discharge stress. Teaching is a ‘calling’ and those that take up that calling are usually very caring individuals. Teachers have ‘hearts of service’ and want to do everything they can for their students. But sometimes we conflate sacrificing ourselves with service. Taking care of ourselves is not selfish. Once again, the paradox is that by taking the inside-out approach, by taking care of ourselves and cultivating our best ‘self’, we’re actually taking care of our students. I think a mindful teacher is one who is consciously working to cultivate their gifts and strengths, and at the same time surfacing old habits and reflexive patterns of behavior that may be hindering their effectiveness. For a mindful teacher, personal development and professional development are synonymous. Of course, a mindful teacher does their best to stay present in the moment with their students. Easily said, but very, very difficult to achieve. Kids know what buttons to push to throw us off and no matter how hard we try there will be things that cause us to lose our center from time to time. The work for us is to notice when it happens and bring ourselves back. Finally, I believe a mindful teacher is one who keeps teaching and learning, and the profession in general, on “a path with heart." What does “a path with heart” look like? As I say in the book, there’s no one way to teach that works for all and finding out what’s right for us is a lifelong journey of self-discovery. But if we turn our attention inward and listen to the quiet voice, the ‘teacher’ within, it will guide us in the right direction… we’ll find “a path of the heart” that is unique and perfect for us. Most of my mindfulness practice comes in the dojo (Aikido training space). I find that re-stating my life’s purpose and a specific intention before beginning my daily practice helps me get more from my training and reminds me why I’m there. It’s my internal narrative and it’s important for me to keep it in the forefront of my attention. It’s so easy to get distracted by the shiny objects in life. Before we know it, we forget why we’re here. We’re doing stuff, but it’s lost its meaning. Re-stating my purpose and intentions when I practice keeps me focused on the things I really care about. 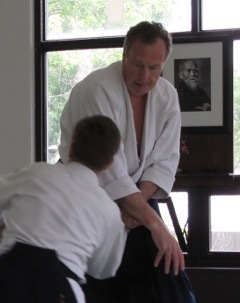 Right now during my Aikido practice, I’m putting more of my attention on staying present and connected with my partner. I’m practicing letting go of the need to know what’s coming next in order to produce the outcome I want. It’s a very challenging practice for me. When things start moving really fast, both on and off the mat, I tend to get afraid, tense up, and hold my breath. For me, learning to relax and breathe while moving with my partner has been a very powerful practice. The less resistant and tense I get, the easier I’m finding it is to build trust. This is true off the mat also. I notice that the more I practice staying present in the midst of what feels to me like chaos, the more confident I am that I can handle the unforeseen. It may seem counterintuitive but the more I’m able to let go and flow with my partner… and with life in general, the more good things seem to come into it. Update December 3, 2015: We turned the tables, and Pete interviewed me at his site The Teacher's Path, about mindfulness and self-care for teachers. This is just a great example of how learning a martial art is so much more than simply "learning how to fight". It disciplines you in so many ways that most people don't even realize. That's a great point, Paul. I've actually heard martial arts training described as "learning how NOT to fight."